Pop out the shapes and follow the step-by-step illustrated instructions to create six Nutcracker characters for play and display. 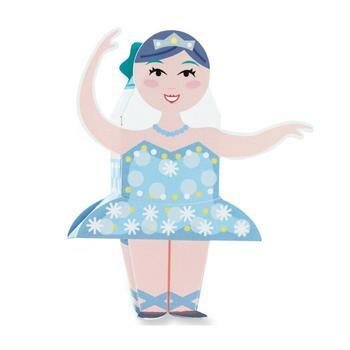 Bring the magic and wonder of the holiday classic to life, and make paper dance! Six charming paper Nutcracker figures: Clara, the Nutcracker, Mouse King, Prince, Snow Queen, and Sugar Plum Fairy.Just punch out the shapes, fold, and tape or glue.Sturdy paper is perforated and scored for convenience. No cutting necessary! Areas to be taped or glued are marked and numbered, so construction is a snap. Simple tips to help young paper engineers create great paper craft projects. A great gift, family activity, or holiday party favor!